Firm: Haliczer Pettis & Schwamm, P.A. 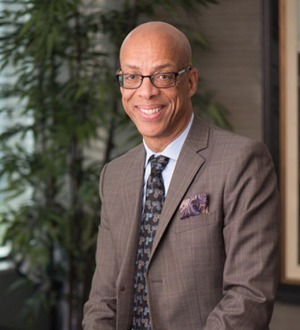 Eugene K. Pettis, a co-founder of Haliczer Pettis & Schwamm, leads a trial practice representing an impressive list of corporate, public sector and individual clients in civil trial matters. He has over 30 years of experience handling a range of complex cases for defendants and plaintiffs in the areas of medical malpractice, personal injury, commercial litigation, employment and professional liability. Mr. Pettis attended the University of Florida where he received his Bachelor's degree in political science in 1982 and his Juris Doctorate degree in 1985. Mr. Pettis, in June 2013, became the President of The Florida Bar, the first African-American to serve in this position. In his role at the helm of The Florida Bar, which governs nearly 100,000 attorneys, he provided visionary leadership and brought a passion for giving back to his profession and his community. He left a legacy of leadership initiatives, which continue at The Florida Bar, including Vision 2016, looking at the future practice of law, as well as the William Reece Smith Leadership Academy which was his brain-child. He is a sought after keynote speaker who has used his engaging and enthusiastic style to motivate thousands. Mr. Pettis supports higher education, serving on the University of Florida Foundation=s board of directors where he has recently been named a Life Member for his service, and currently on the board of trustees at the University of Florida's Levin College of Law. Mr. Pettis’ trial and litigation skills are highly regarded as evidenced by the rare recognition by the Best Lawyers in America where he has been recognized as the Lawyer of the Year for plaintiff medical malpractice 2017, Lawyer of the Year for personal injury defense 2018 and Lawyer of the Year for employment law 2013. He is a perennial selection by his peers for inclusion in Florida Super Lawyers, the South Florida Legal Guide “Top Lawyers” list and Florida Trends “Legal Elite”. He was a 2007 inductee to the exclusive invitation only American College of Trial Lawyers and elected by his peers into the American Board of Trial Advocates (ABOTA). In January, 2013, he was recognized by his ABOTA Chapter as The Trial Lawyer of the Year in Ft. Lauderdale, FL. In recognition of his commitment to community service, Mr. Pettis was recognized in 2012 by the Urban League of Broward County with the Margaret Roach Humanitarian Award. Mr. Pettis received the South Florida Business Journal’s 2014 Ultimate CEO Award which recognizes Miami-Dade, Broward and Palm Beach County’s top executive for their expertise, leadership and community involvement. Mr. Pettis is admitted to The Florida Bar (1985). He is admitted to practice in all District Courts in Florida, including Southern District, Middle District and Northern District. He has two daughters, the oldest a litigation attorney in Orlando and the youngest pursuing her doctoral degree in child psychology.